Indiana State University Foundation President Ron Carpenter today announced the appointment of Catherine Saunders as executive vice president of advancement. 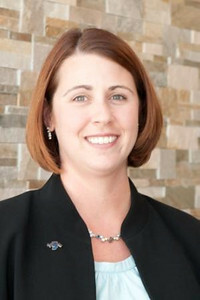 Saunders previously served as interim vice president of development and assumes her new role immediately. "During the past few months, Catherine has met every challenge and opportunity with glowing results," Carpenter said. "Her dedication, professionalism and integrity have proven her talents as a manager and her fundraising experience and ability will position the foundation for success." Under Saunders' direction, the foundation has enhanced its annual giving and athletics giving programs and carried out successful donor events and major giving fundraising initiatives, Carpenter noted. In her new role, Saunders will lead the foundation's advancement initiatives, including all aspects of fundraising, alumni engagement and communications. The foundation's advancement team works to establish and accomplish the university's fundraising goals. "Integrating the work of our development, alumni and communication teams will streamline our engagement efforts and strengthen our ability to secure resources for Indiana State," Saunders said. "We have such devoted alumni and friends and dedicated staff; I am honored to continue to work with them during this exciting time in the life of ISU." Saunders is in her fifth year with the foundation and has served as the associate vice president of development as well as a development officer during "MARCH ON! The Campaign for Indiana State University." In this position, she secured major gifts contributing to the successful completion of the university's first comprehensive campaign. Saunders is a graduate of Saint Mary-of-the-Woods College. "Catherine has been a great asset to Indiana State over the last several years in her role as a development officer. Her knowledge of Indiana State and the relationships she has developed will help accelerate our fundraising efforts to meet the needs of our students and community," said university President Dan Bradley. Indiana State University Foundation President Ron Carpenter today announced the appointment of Catherine Saunders as executive vice president of advancement.